Passport/Visa Requirements: US citizens need only a passport for stays up to 90 days. Time Zone: 2 hours ahead of Greenwich Mean Time, 7 hours ahead of Eastern Standard Time. Endlessly fascinating, Greece's tapestry is woven across centuries of rich culture, architecture and art. Though small in size, Greece has had a far-reaching impact on the world. Its Mediterranean location as the southernmost European country puts it at the crossroads of Europe, Asia and Africa, reflecting a treasure trove of civilizations – Classical Greece, the Roman and Byzantine empires, and 400 years of Ottoman rule. As the cradle of the first advanced civilization in Europe, Greece is the birthplace of democracy, the Olympic Games, and Western philosophy, literature and art. 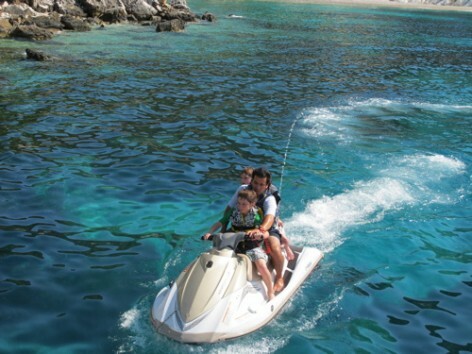 A warm, sunny climate and a convivial atmosphere make Greece the perfect place for families. My kids traveled from the pages of history and mythology books to a place where gods and monsters mingle. In Athens, they explored ancient Agora and the temples of Poseidon and Zeus, rode the funicular up Lycabettus Hill – Athen's highest point – and followed the Royal Guard, garbed in traditional kilts and high, red clogs. Travel beyond Athens included day trips to Mycenae and Cape Sounin, but our favorite experiences have been boat cruises to the islands. On our first family excursion, we cruised the Cyclades Islands and the Peloponnesian Coast. Our captain navigated a sailing adventure to hidden sea caves dripping with stalactites, and the bluest of water for snorkeling, tubing, jet skiing and wake boarding. We even dove for octopus, which we barbecued on the beach! On our second boat trip, our captain suggested the Ionian Islands. This journey took us through the historic Corinth Canal to Greece’s west coast, where we discovered a string of dazzling islands, blessed with sheer white cliffs, spectacular sandy beaches, luminous caves and endless opportunities for exploration. My kids became mythical sea creatures, conquering the water by jet ski, tube and wakeboard. And just like our first cruise, our savvy captain and family-friendly crew went out of their way to create an unforgettable holiday.